The Wobage Summer Exhibition opens on Saturday 28th May and continues every day 10am – 5pm until Sunday 5th June 2011. 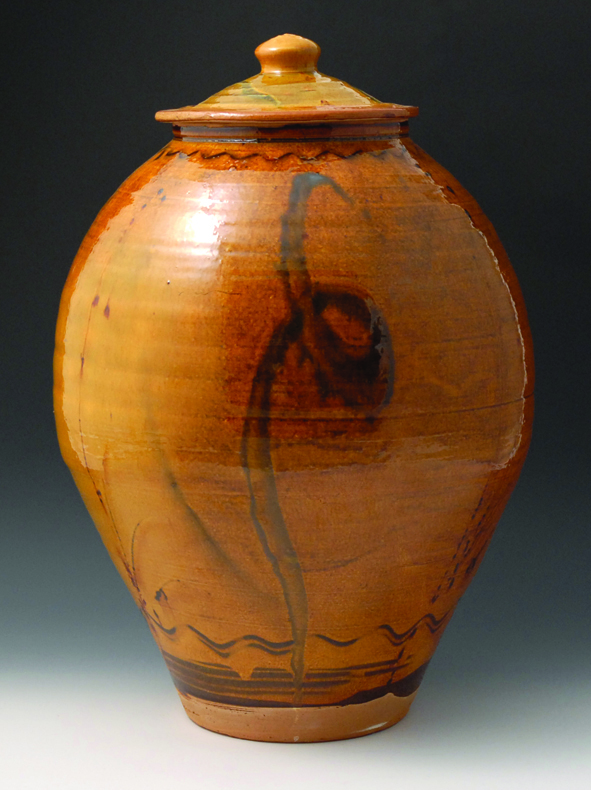 We celebrate Patia Davis’ 20th year at Wobage with an exhibition featuring both her porcelain and slip-decorated earthenware. She has been prolifically moulding and slabbing out new flat-ware to add to her already acclaimed square dishes, large and small. The depth of surface and colour just gets more and more intriguing and beautiful. We have an exciting line up for this Summer’s Wobage course programme and there are still one or two places available on most of the workshops. Clive Bowen visits the 5 day jar-making course for two days of demonstration and tuition. Designer maker Tavs Jorgensen leads a plaster workshop with hot trade tips on profiling & sledging hump moulds. Josh Redman demonstrates his inimitable techniques in softly thrown sculptural pot-making on a new long weekend workshop suitable for all levels of ability. For full details, prices and availability, please browse our course pages. Back in the well-equipped studio, we experimented with applying our designs onto clay extrusions, using mono-printing, brushwork, finger-wiping, rouletting and various other application techniques appropriate for salt-glaze firing. We then focused on making shallow thrown and altered forms: making ovaled, squared and free-form dishes and platters. Later, we began applying our chosen surface designs and treatments to these forms and moved on to making thrown and altered taller forms. We also explored ways to improve our basic throwing techniques, plus the use of throwing ribs of various kinds, profilers, handle and foot-making and rolled rim-making. Particularly helpful was two-person throwing with Jeremy which allowed us all to experience what expert throwing feels like. Turning a 5lb lump of clay into a perfectly even tall vessel in just three lifts was certainly a first for me! 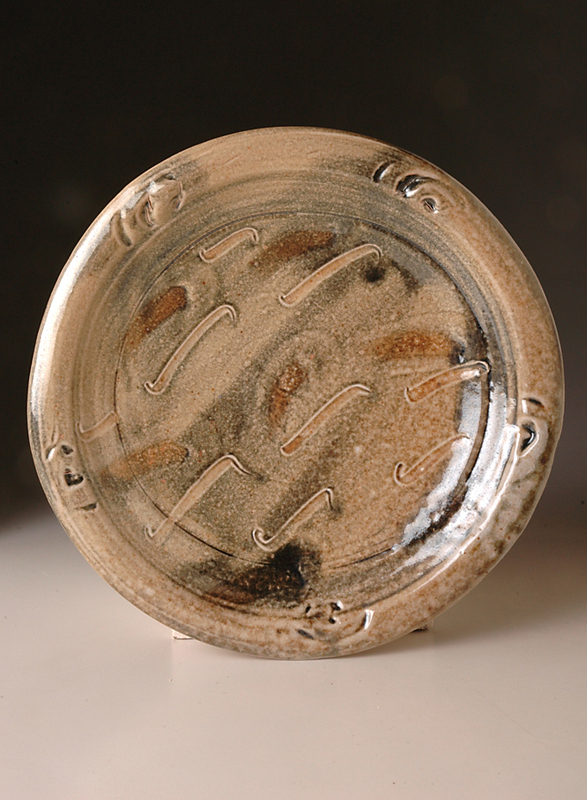 The clay we used (an iron-bearing stoneware made at Wobage) is absolutely wonderful for throwing – very plastic and yet very strong – certainly the most forgiving throwing clay I’ve ever encountered. Hopefully this clay and an iron-free whiter version will become available commercially in the future. 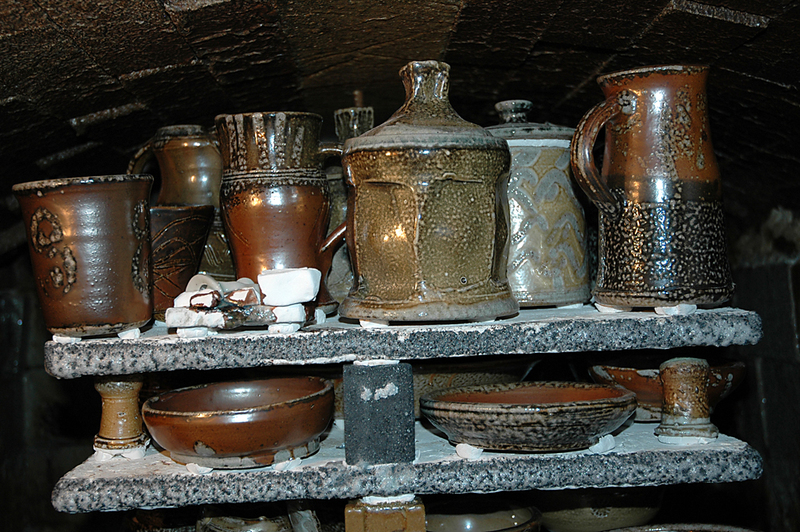 Of the very many vessels that were produced over the five days, we were asked to select six each for salt-firing at a later date, others could be taken home green or left for bisque firing. During the course, we had an interesting demonstration of jug-making, faceting and free form building from Josh Redman, a new member of the Wobage team. We also enjoyed a trip to Wally Keeler’s home and studio/gallery. This was a real treat: Wally was very generous with his time, patiently explained his making and firing processes, and kindly showed us round his studio, lovely garden and home full of gorgeous pots. On the last evening, we had pizza and film night – home-made pizzas cooked in a proper wood-fired hand-built oven in the courtyard – Yum! Each day, tea, coffee, delicious cakes and biscuits were available, and everyone brought contributions to a shared lunch, eaten under a sailcloth awning in the garden. The setting is marvellous, with beautiful views across the countryside, lovely old buildings in a courtyard arrangement, including a gallery, and an ancient barn recently refurbished to display a Mick Casson retrospective. There is a small flat available to rent, book early to avoid missing this. Camping is free on site. There is plenty of reasonably priced B&B accommodation available locally. Josh Redman is currently prolifically making towards exhibition at Milkwood Gallery in Roath, Cardiff, South Wales. Alongside these magnificent tall narrow bottle forms for the large window display of the gallery, Josh is working on an installation entitled ‘Dinner For One’ in their main gallery. He will also be featuring a set of 27 photographs for display as a ‘conceptual postcard’. Intriguing and inspirational stuff. We look forward to the Private View on 2nd June 2011 after which the exhibiton runs for 4 weeks. For more information as the exhibition draws closer, follow Josh’s blog online. Jeremy and Patia are currently exhibiting at Ruthin Craft Centre in North Wales, a mixed show featuring 12 makers and entitled ‘Slip’. To paraphrase curator Gregory Parsons, the materials and techniques may be simple, but the results can be astounding. With a range of practice that spans the traditional to the modern and contemporary, the work demonstrates without doubt that the use of slip continues to evolve as a vital medium for creative self-expression in the 21st century. The exhibition continues in Ruthin Gallery 3 until 12th June 2011. Here follows a short essay written by Jeremy for the exhibition catalogue. “I use slip in various forms in the making of my high-fired salt-glazed stoneware and porcelain. 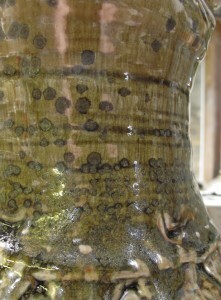 Along with the term ‘slipware’, slip is much more commonly associated and categorized with the tradition of lower firing temperatures and brightly coloured earthenwares, such as the magnificent chargers of Thomas Toft and other Staffordshire lead-glazed pottery of the late 17th and early 18th centuries. 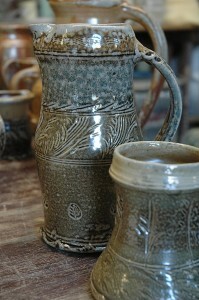 I hold a deep respect for these potters and their skillful, exuberant and playful use of slip in it’s wet state. Indeed, it was with reference to this vernacular that I feverishly began experimenting with slip as a student. Exactly how the many and varied techniques which the Staffordshire potters employed, first made their way into common use will never truly be known. However, I am certain that we share with these makers a motivation that is primal, for the sensuous qualities of the very material itself. Submerging a full armful of the gorgeous stuff is only the beginning; thick, creamy and smooth, the slip is stirred and paddled to ensure an even liquid suspension before it’s use. In common with generations of artistic endevour, we find the development of the materials in our hands, lends us the freedom to run with new ideas. The ingredients are often basic, at it’s simplest a single clay suspended in water. A combination of clays is often blended, sometimes with a small percentage of oxides for colour and other additions to alter surface quality or firing maturation. Despite this frequently simple composition, slips underpin a limitless wealth of creative possibilities and sophisticated surfaces. The influence of slip on my making begins on the wheel from where most of my shapes evolve. With the wet scragfitto of marks often made directly onto the wet clay surface of the slowly revolving pot, I am envisaging this vocabulary of drawing soon to be cloaked in a thick veil of ball clay slip. Rather like multiple layers of limewash applied to a vernacular stone building, detail and edges are softened, overall composition unified. 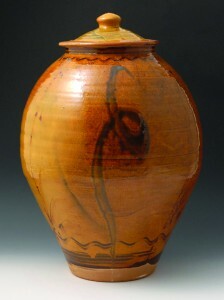 This is usually the first of at least one other layer of slip, which will be applied later for colour or surface variation to part or all of the pot. Over many hours, or often several days of drying and reapplication of different slips and related mark-making, this layering and re-working keeps the clay alive and crisp. Along with it, the inherent risks of raw slipping and glazing for the work to collapse under renewed water saturation from the freshly applied ingredients. Working as I do, alongside a small community of other artists, I am periodically mocked for my ‘multiple slipping’ habits, with pots unashamedly indulged in five or six slip or raw-glaze treatments before being finally allowed to rest in preparation for firing. “Surely…” they mock in jest, “I could compose a single ingredient that would do the same thing in one go?” Fear not! Slip in this way continues to form a crucial aspect to the improvisation of new ideas, and the expansion as well as honing of a compelling range of fired surfaces. Local photographer JP Kavanagh, who has worked extensively with many of the Wobage Makers in previous years, has been collaborating again with Patia and Jeremy in developing a small body of framed work for the May exhibition. 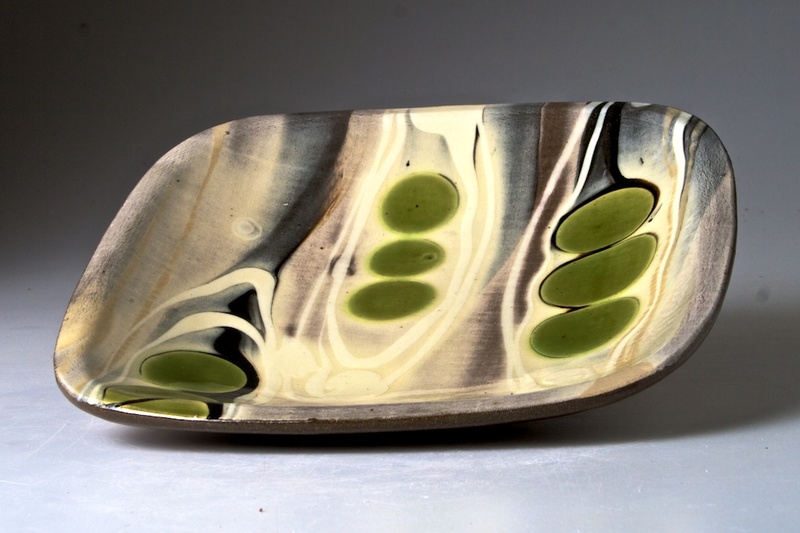 The Wobage Gallery is delighted to celebrate Patia’s work in this year’s Summer exhibition, marking her 20th year as resident maker at Wobage. The Summer exhibition at Wobage begins on Saturday 28th May and continues every day until Sunday 5th June. Kavanagh is collaborating with Jeremy Steward in the development of his own website, and also towards a joint exhibition with Jeremy at the Pop-Up Gallery of Cirencester Brewery Arts in the Summer of 2012. The working title for this show, ‘Salt on Salt’ will include a group of Kavanagh’s salt processed prints alongside Jeremy’s wood salt-fired pots. They will be showing alongside local artist friends Nigel Lambert and Mariette Voke. 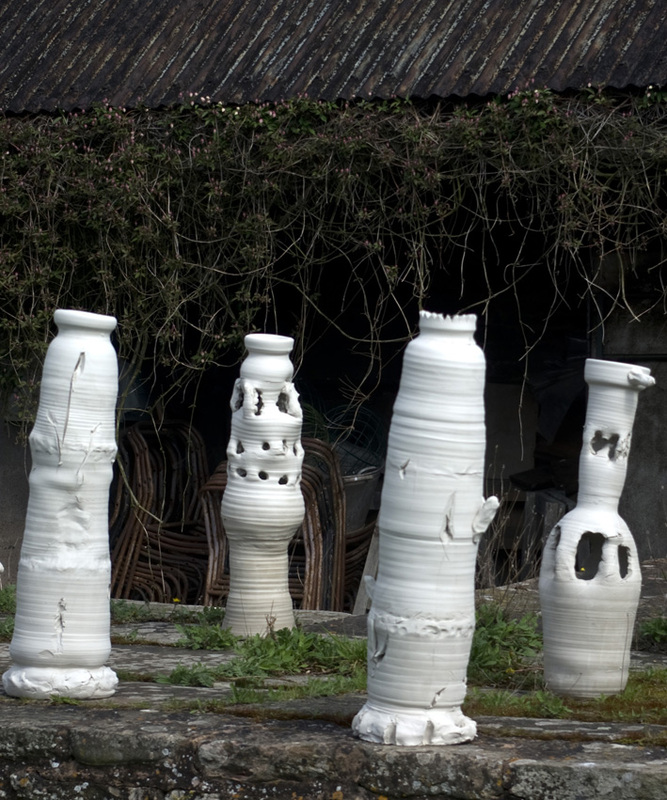 Congratulations from the Wobage Makers to Thursday evening class student, Clare Mace, who has acquired a place from Autumn 2011 on the BA Ceramics degree at Howard Gardens, Cardiff. Clare joins another ex. Wednesday class student Wendy Houghton, who began the same UWIC degree last year. Good luck Clare! The 10 week block of Summer evening classes are now upon us. A most enjoyable term for the light evenings and the warm gently breeze that predominates over Wobage’s microclimate! Perfect conditions, we anticipate but don’t guarantee, for much quicker drying and pot turnaround of an evening. Wednesday and Thursday class numbers are already up to maximum, however there are still places available for Josh’s Friday class. Any budding amateurs or complete beginners, keen to improve skills, or try their hand for the very first time with soft clay on the wheel, please get in touch asap to reserve your place. Looking forward to the Autumn term, beginning September 2011, at least one place will become available on Jeremy’s Thursday’s class. It also seems likely that due to popular demand, Josh’s class will change from a Friday to a Tuesday. We look forward to welcoming some new students to Wobage over the coming months. You’ll find more detailed information about our evening classes on our course pages. For availability you can contact us from our booking page, following which someone will contact you. 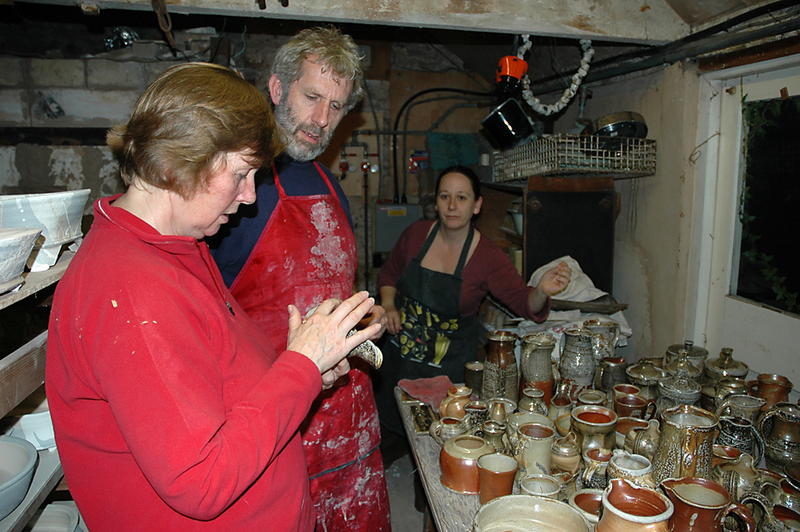 The image above features salt-fired pots made and decorated by evening class participants on Jeremy’s Thursday course.